Thermal polishes are pretty awesome, add glitter and you're onto a winner. Born Pretty Store have quite a range of thermal polishes which now include a few glittery ones, I have tried the Blue/Purple polish. The cold state is purple and the warm state is an aqua blue. It has 3 different sizes of hex glitter which I think is either a pearly white of a light matte silver, which means that during each state, it looks like a pastel shade of that colour. This was the best transition photo I could get, it's pretty cold here atm and even with the heating on, my hands seem to be permanently cold so the nails were all completely purple. I had a bowl of warm water next to me for photos. Here is the polish just after a water dip, mostly blue with just a small amount of the tips purple. I do love that thermal polish gives you the look of nail art without you having to really do anything, although I would say it looks a bit better with a longer nail, if you have warm hands a longer nail tip would be in the cold state while the nail attached to your finger would be in warm state giving you a half and half gradient look. All these photos are 3 thin coats with 1 coat of Seche. The polish dries quickly and I would recommend using a nice thick top coat because of the glitters. Adding a top coat does not affect the thermal at all. I just realised that the only other thermal I have tried had the same colour transition (purple/blue) I must have a thing for that combo. Anyway, if you would like to get this polish you can do it here for £3.23/ $4.96 and have a look at the other thermals, they have some really pretty colours. 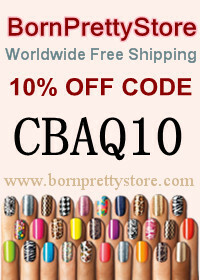 Don't forget to use my code CBAQ10 for 10% off your basket on non sale items. Have you seen that thermal top coat from Bow Polish that goes from clear to black? I have seen some really pretty mani's using it, I really hope Born Pretty bring out a version of that soon.